Segestria florentina is the biggest European segestriid spider. Some common names are tube web spider or cellar spider, although neither are exclusive to this species. Females can reach a body length of 22 mm, males up to 15 mm. This species is much darker than others of the same genus. 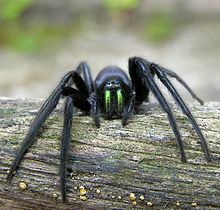 While subadult spiders have a greyish opisthosoma with a marking similar to Segestria senoculata, adults are of a uniform black, sometimes with a green iridescent shine, especially on the chelicerae, which reflect with a striking green. The sexes are similar. Adults occur from June to November. They spin a tubular web, often in cracks of buildings. Six or more silken lines radiate from it, and the spider waits in the entrance, touching the lines with the frontal six legs. Prey triggering these lines get caught, and the spider immediately retreats again to eat it. However, in some cases the spider will kill and begin to consume its prey in the opening of the tube, but will retreat further if disturbed. They hunt nocturnal insects such as moths and cockroaches. Bees and wasps are always bitten at the head end, so the sting will face away from the spider. The female lays her eggs inside the tube web. Sometimes she will die after the spiderlings have hatched, and they will eat their mother. The spider can be lured to the entrance by gently touching the triplines with a stick in the evening or at night. Originally a species of the Mediterranean region as far east as Georgia, it can now be found in many towns in southern Britain, where they were probably introduced via seaports at least since 1845. It has been found in several places in Cornwall, South Molton North Devon Plymouth, Bristol, Swindon, Gloucester, Ashford, Deal, Dover, Hayes, Southampton, Salisbury, Whitstable, Canterbury, South East London, Vinters Park, Maidstone, Portsmouth, Exeter, Sittingbourne, Isle of Sheppey, Essex, Faversham, Sheffield, Bridgwater and Newport, where it prefers south-facing walls. Specimens have been found in Exeter Cathedral as far back as 1890. It has also been found in Argentina, Australia and several Atlantic islands, where it was probably also introduced. Its bite is reportedly quite painful. It has been compared to a "deep injection", and the pain can last for several hours. Two neurotoxins and one insecticide were found in the venom. The venom reduces the rate and amount of sodium inactivation. Bites are reported to feel like a bee sting, which would make it a 2 on the Schmidt sting pain index, but does not have any lasting effects. ^ a b Bellmann, H. (1997). Kosmos-Atlas Spinnentiere Europas. Kosmos. ^ a b c "Tube web spider, Segestria florentina". Natural History Museum. Retrieved 2009-09-26. ^ a b "Science & Nature - Wildfacts - Tube web spider". BBC. Archived from the original on 2009-06-08. Retrieved 2009-09-26. ^ "Nick's Spiders - Segestria florentina". Nicksspiders.com. Retrieved 2009-09-26. ^ "Andy Seaman's spider lodge". kentonline.co.uk. Retrieved 2012-11-01. ^ "Rare Segestria Florentina spider colony found in Gloucester street". Thisisgloucestershire.co.uk. Retrieved 2009-09-26. ^ "Bridgwater homes infested with Mediterranean spiders". Bridgwater Mercury. 2014-09-30. Retrieved 2014-10-28. ^ "Fanged cannibalistic tube spiders with bite like bee sting found in street in Wales". Wales Online. WalesOnline. Retrieved 8 October 2014. ^ "Segestria florentina in Cornwall". Stevehopkin.co.uk. Retrieved 2009-09-26. ^ Sagdiev, N.Zh. ; Valieva, L.A.; Korneev, A.S.; Sadykov, A.A.; Salikhov, Sh.I. (August 1987). "Toxic components of the venom of the cellar spider Segestria florentina". Bioorganicheskaia khimiia. 13 (8): 1013–1018. PMID 3675645. Wikimedia Commons has media related to Segestria florentina.